1Candidate, Faculty of Medicine, Mahasarakham University, Maha Sarakham, 44000, THAILAND. 2Alternative Medicine College Chandrakasem Rajabhat University, Chatuchak, Bangkok 10900, THAILAND. 3The Academy of science, The Royal Institute Sanam Suea Pa Khet Dusti Bangkok 10300, THAILAND. 4Department of Biology, Faculty of Sciences, Mahasarakham University, Maha Sarakham 44150, THAILAND. Context: M. pudica is a common plant found in moist waste ground, lawns, open plantations and weedy thickets. Aims: The fasting blood glucose levels (FBG) and hematological values of M. pudica aqueous(MPA) and hydro-ethanolic (MPHE) extract were evaluated in normal and streptozotocin (STZ)-induced diabetic rats. Materials and Methods: MPA and MPHE 125, 250 and 500 mg/kg body weight (b.w.) were administered orally and daily to the rats for 8 weeks. The FBG were determined weekly. Red blood cells (RBC), hemoglobin (HM. pudicab), hematocrit (Hct), platelet, mean corpuscular volume (MCV), mean corpuscular hemoglobin (MCH), mean corpuscular hemoglobin concentration (MCHC), white blood cells (WBC), lymphocytes, monocytes, neutrophils and eosinophil were evaluated. Results: MPA and MPHE had no effect on blood glucose levels in normal rats. All doses of all extracts showed significantly (p<0.05) decreasing FBG in diabetic rats. Especially MPA at the dose of 250 mg/kg b.w. showed more potent significantly (p<0.05) decreasing blood glucose levels than anti-diabetic drug glibenclamide at the end of experiment. 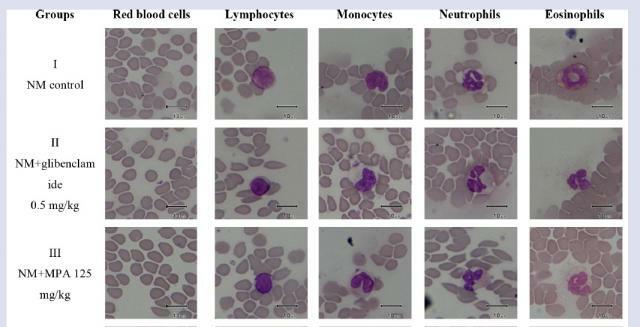 All extracts had no effect on RBC, Hb, Hct, platelet, MCH, MCHC, lymphocytes, monocytes neutrophils and eosinophils. Surprisingly, the extracts were decreased WBC and MCV in diabetic rats. In addition, all of the extracts did not produce the alteration of blood cells structure in all rats. Conclusion: This study indicated that the extracts were hypoglycemic effect and improve hematological values in diabetes which confirms the traditional use of the plant. Konsue A, Picheansoonthon C, Talubmook C. Fasting Blood Glucose Levels and Hematological Values in Normal and Streptozotocin-Induced Diabetic Rats of Mimosa pudica L. Extracts. Pharmacognosy Journal. 2017;9(3):315-322.